I don’t enjoy being bossy or coming off as a nerdy, Facebook marketing know-it-all. I’m constantly learning and as much as I focus on Facebook there’s plenty I don’t know or fully understand. But there are far too many marketers who are polluting Facebook with baseless claims and ineffective strategies, resulting in many others following their collective lead. So, here’s my attempt to do my part. Please stop doing these things. I thought we were done with this madness, but I still see it. Too many Facebook marketers have an unrealistic expectation regarding the number of Fans who will see a given post. If you have a basic understanding of math and online user behavior, you realize that most of your Fans won’t see your content whether EdgeRank existed or not. You realize that only half of all users visit Facebook every day. You realize that of those who do visit, the average user will only visit for 30-60 minutes. You realize that your content is competing with mounds of posts from friends, family members, apps and other Pages. You realize that on Twitter, even fewer of your followers will see a given post. A fraction, in fact. You realize that a small percentage of your Fans actually care whether they see most or even some of your posts. Yes, EdgeRank exists. 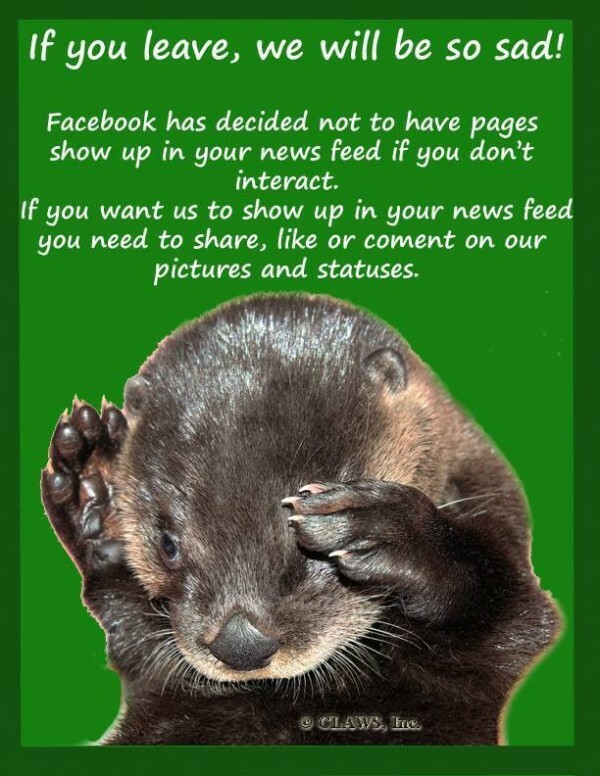 Yes, Facebook may decide not to show your content to specific Fans who have shown no interest in your boring content. And yes, you may need to pay to reach some of your Fans. But Facebook also helps surface your content to Fans who may have otherwise missed it. You blame EdgeRank, but in the end good content rises to the top and it will help you. Still, you find the need to write posts that complain to your Fans about how you aren’t reaching them. You know what? They don’t care. The vast majority of your Fans who liked your Page don’t care if they see 100% of your posts. They won’t miss the ones they don’t see. By sharing a whiny post about how you can’t reach them, you may just drive the ones who do care away. Don’t be fooled by the few Fans who sympathize with your plight. By complaining about this, you look unprofessional and you’re doing your brand and your message more harm than good. Oh, no! Your Reach is down! Hey, look! If you create status updates, you’ll reach more people than if you post photos! Whoa, you should never share links because they reach fewer people! Reach isn’t completely worthless. But it’s close. It should be considered. But it doesn’t tell the story of whether your content succeeded or failed. Reach is good as a reference point. But you should worry most about specific types of engagement that lead to a desired action. Start focusing more on link clicks. And shares. And video plays. And whatever action it is that is central to your success. Reach is far too flawed to trust. It’s far too inexact to be the focus of your campaign. And you’re far too sophisticated to lose sleep over it. Woo hoo! Half of my Fans clicked Like on my cat meme! I’m awesome! What’s that? How many link clicks did it drive? How many sales did it generate? Ummmmmmm….. The problem with EdgeRank is that far too many marketers now try to manipulate it. They know that more engagement means more Reach. So they post a bunch of fluff that generates a ton of engagement. A ton of meaningless engagement. Look, having some fun with your Page is fine. Posting an occasional fluff piece of content that generates easy reactions can actually help you. But stop making these types of posts central to your strategy. You may generate plenty of engagement from memes, cat photos and other similar posts. But if you rely too heavily on them, you’ll start attracting the type of Fan who cares only about that stuff. When you do that, you lose the Fan who actually cared about your product, service or niche. Some liked your Page because of the value you could add to that conversation. And it’s this type of Fan — not the meme lover — who is most likely to result in business. Oh, no, my number of Likes dropped overnight! Hey, look, I got 5,000 new Likes! None of them speak my native language, but… LOOK! More Likes! This shouldn’t shock you, but it’s quality over quantity. The number is cosmetic. It means a little. But it doesn’t mean a lot. If your ultimate goal is to drive meaningful traffic, interactions and business, you want quality Fans who actually care about your product or service. If your Facebook Page isn’t driving meaningful traffic, interactions or business, it could be because you focused too heavily on quantity and not enough on quality. Should you celebrate reaching new milestones? Sure. Should a number of Likes determine your success or failure? Absolutely not. In the end, it’s just a number. You can’t trade in Likes for cash. Your measure of success will ultimately be determined by the number of desired actions your Fans and their connections perform, whether from a small or large pool. Facebook advertising is powerful. But if you are clicking that “Promote” or “Boost” button next to your post, you are not experiencing the true benefits of what Facebook has to offer. I continuously hear complaints about how advertisers can no longer target Fans only with their Promoted Posts. My response? Stop doing it. Promoted Posts are intended for the beginner advertiser. It’s meant as an easy way to entice you to spend some money. But it is cookie cutter and only scratches the surface of what you can do. You should still promote your content, but in much different ways. If you’ve read my content before, you’re likely tired of reading this: Use Power Editor. UGH! Facebook is rolling out a new News Feed! I want the old News Feed back! Still more Facebook ad options? I can’t keep up! STOP WITH THE CHANGES! I hate to sound harsh, but quit your whining. I know you prefer the old News Feed. I know you prefer the old, old News Feed. I know you prefer the old, old, old News Feed. But it’s not coming back. The old Facebook was primitive when it came to marketing. The targeting options were few. The advertising options were limited. I won’t say that every change is good. But if you understand Facebook, you know that what is available to marketers today is far more powerful than what we had even a year ago. Is it difficult to keep up? Maybe. Sure, it is. But it’s in the name of progress. These changes will ultimately help you. Now that you’ve stopped doing things, it’s time to focus on the right things. Start researching the power of Facebook advertising. Start focusing on the metrics that matter.